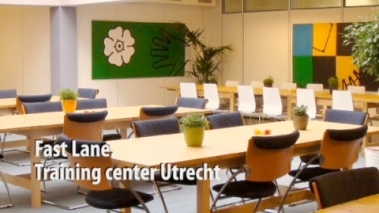 The Fast Lane training centres in the Benelux have large classrooms that can be used for various purposes. Training courses, workshops, seminars or meetings: we are happy to address your needs. In all classrooms a projector, screen and whiteboard is available. Dependant on your needs we will use PC’s or laptops and/or Internet access. Our classrooms can be either rented for a full day or a part of the day. Lunch, refreshments and dinner can be arranged. All of our training centres are well accessible by both public transport and car.